When planning a wedding in these tough economic times, every bride (well every bride that doesn’t have a money tree or trust fund) is tightening the purse strings. The bulk of the budget will go to the location and food. After that, you MUST get your dream dress, and the bridal party’s attire. When all is said and done, there isn’t must money left over for your bouquet, let alone the bridesmaids’ . So what is a girl to do when the bridal bouquet can cost upwards of $200, and that isn’t including bouquets for the bridesmaids, flowergirls, or the groom and groomsmen’ boutoniers! This is the time in planning your wedding to get a little creative, and have fun with it! Have the adorable flower girls carry something like these baskets. The baskets can be filled with anything from flower petals to confetti or (fake) snow. The ivy intertwined throughout the basket and handle will fit in perfectly for many wedding themes (antique, romantic, etherial, etc…). Having a hard time deciding on your something old, new, borrowed and blue? Check out these amazing bouquets below. They are made up of brooches! They still have flowers, yet they won’t cost and arm and a leg, and they wont put you in the poor house. Borrow a brooche or two (or more if you have the option) from the ladies in your family and your groom’s family. They will be honored to have such a special part in your wedding. Instead of throwing the bouquet (this will be heavy), hand out one brooche to each of the single ladies present at the wedding (or just a select few if you are having a large wedding). You can also keep this momento for the rest of your life because unlike flowers, this bouquet will never die. One hot new thing that you can find in almost every wedding is feathers. They are inexpensive and add the whimsical vibe that many brides are trying to convey. What better way to start off your hollywood glam wedding than walk down the aisle with a bouquet of feathers. Look closely and you can see that some of the feathers are made to resemble flowers. Just add a few embellishments like pearls, crystal or glitter and you will feel like you are a movie star! Just think about all the benefits to using feathers: 1. You won’t need to do hundreds of push-ups in the months leading up to the wedding day (unless its a part of your bridal boot camp and you want to!) 2. The savings you get from not purchasing a flower filled bouquet, you can buy a new bikini, dress, shoes, etc. for your honeymoon and 3. Your guests will be talking about this bouquet every time the conversation turns to wedding talk. Are you having a candlelit evening wedding? The pictures you that you would get of your bridesmaids walking down the aisle holding something like the lanterns below would be fabulous! Going for a really romantic vibe? You can’t get more romantic than tons of candles. What would make more a statement? If you have a color scheme that you are trying to stick to, you can always get a little crafty. Lanterns are sold on some colors, yet if you are looking for a fuchsia lantern, you may have to get some paint and have a good time with some girls and paint them, the major advantage of this is that you can be positive that you will get the correct shade of fuchsia (or whatever color you are going for)! You can also control the color that the candles give off. You can either use colored candles or go to your local craft store and check out their stained glass section where you can pick up some stickers to put on the glass section fo the lantern (i.e. the blue lantern). Going for a cuter vibe for your wedding? 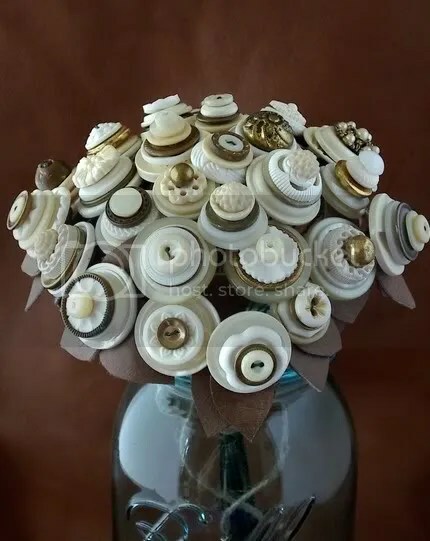 This bouquet made of buttons will be sure to please you. The adorable buttons are made to look similar to flowers and they will add a touch of whimsy. Buttons can be fairly cheap and with a DIY attitude and some elbow grease you are bound to save a LOT of money as opposed to buying a typical flower bouquet. If you loved the brooche bouquet but don’t want to spend the evening carrying it around, this is a much lighter alternative. As with the majority of ladies, I have seen my fair share of wedding things/ideas, and it gets pretty hard to surprise me. When i came across this bouquet, I thought it was gorgeous! But, I am writing about alternatives to flower bouquets, so unfortunately I wouldn’t be able to include it. But as i looked closer I realized that it wasn’t flowers that made up this bouquet. It is actually origami. This is a prefect bouquet for a bride that still want to walk the aisle with a bouquet of flowers but with a twist. At first glance, like myself, most guests won’t even know this isn’t made up flowers. If you, or someone close to you is allergic to flowers, yet you have always dreamed of having a bouquet of flowers, this is right up your alley. This is another great craft project for you and the bridesmaids. However this one may take a lot longer, so make sure you start this so it will be finished before the big day. ← Wedding Montages and More!